SEATTLE, June 19, 2018 /PRNewswire/ — Boeing [NYSE: BA] and Jet Airways today celebrated the delivery of the airline’s first 737 MAX airplane. Jet Airways will be first Indian carrier to fly the new and improved 737 airplane, which delivers a double-digit improvement in fuel efficiency and improved passenger comfort. This delivery marks the first of 150 737 MAX airplanes the Mumbai-based airline has on order with Boeing, following two separate orders for 75 jets placed in 2015 and earlier this year. 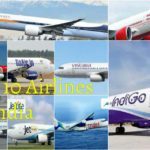 Jet Airways is India’s second-largest airline with a fleet of nearly 120 airplanes serving more than 60 destinations across 15 countries across Asia, Europe, North America and elsewhere. The 737 MAX is the fastest-selling airplane in Boeing history, accumulating more than 4,500 orders from 99 customers worldwide.